AI and DI are part of the engine that powers winworks.ai. And managing and analyzing data responsibly and securely is core to our mission. Today’s senate intelligence meeting is probably the most important two-hour video you should make time to watch this week, especially if you are interested in the intersection between AI, DI, and national security. Also some important cautions about Internet of Things (IOT) security. Mark Rogers: “…with the power of machine learning, artificial intelligence and big data analytics…data concentrations are a target…. General Ashley: “There is a key piece of this…which is how do you operationalize it….a WWII example: the fact that there were planes, radios, and tanks, was not unique to the Germans in WWII…they came up with an operational concept that allowed them to leverage that…[I asked Peter Singer]… as you look at the things that are emerging… what do you see in the way of a breakthrough that would give somebody a really marked advantage…. [Singer said it’s not that I see something that gives someone a marked advantage..].. It’s who’s able to harness it, who’s able to operationalize it, and put it to effect. 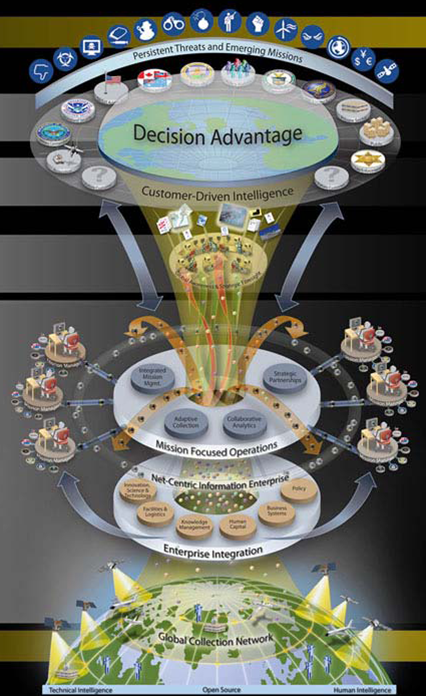 This diagram is as relevant as ever: the goal of the collection and analysis of data is decision advantage. DI is a framework for taking it seriously: in government and beyond.